Food stamp usage has leveled off in growth yet is still alarmingly high. As of April 2013, 47,548,694 people were on food stamps. That is 1 out of every 6.64 persons in the United States.. This means that 15.05% of all people living in America are on food assistance. The United States population in middle of April 2013 was 315,928,000 and this figure includes everyone, including Americans overseas. 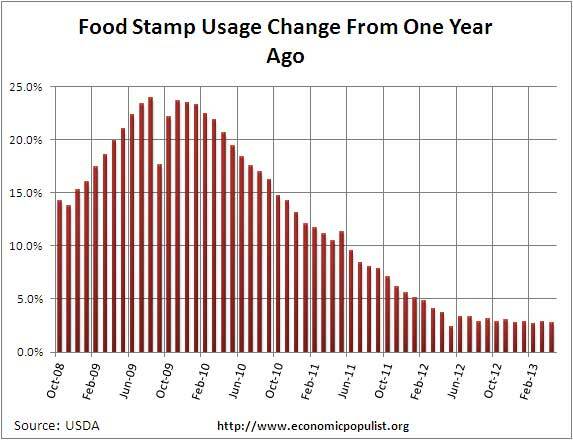 Food stamp usage has increased 2.8% from April 2012. 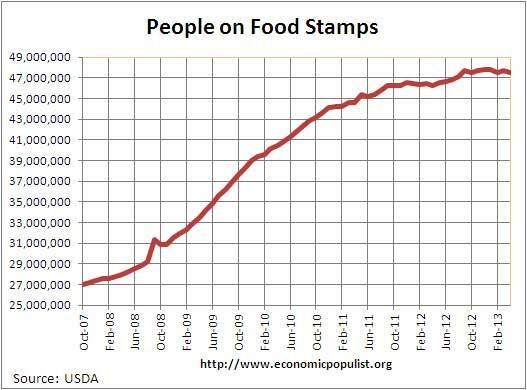 Since October 2007, food stamp usage has increased 76.06%. The population has increased 4.3% during the same time period. It is clear America has not recovered from the great recession and is obviously still hurting. 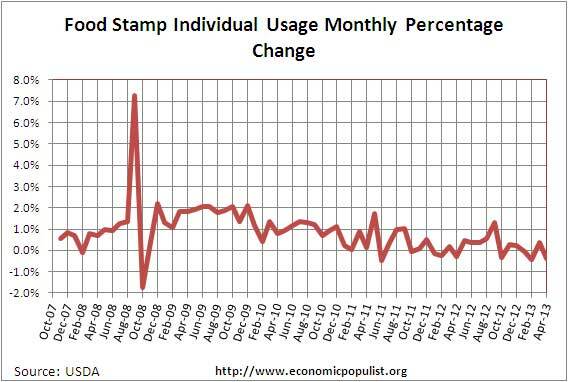 Graphed below is the monthly percentage change in individual food stamp usage. Below is the percent change from one year ago in food stamp usage by individuals. We can see even though the recession was declared over in July 2009, food stamp usage is still rising annually, although not at the soaring rates as seen in 2010 and 2011. The continued increase is actually not a surprise for the unemployment rate is still high with an estimated 20 million needing a job. On top of this wages are repressed, so many who are working still fall below the poverty line and thus qualify for food stamp benefits. 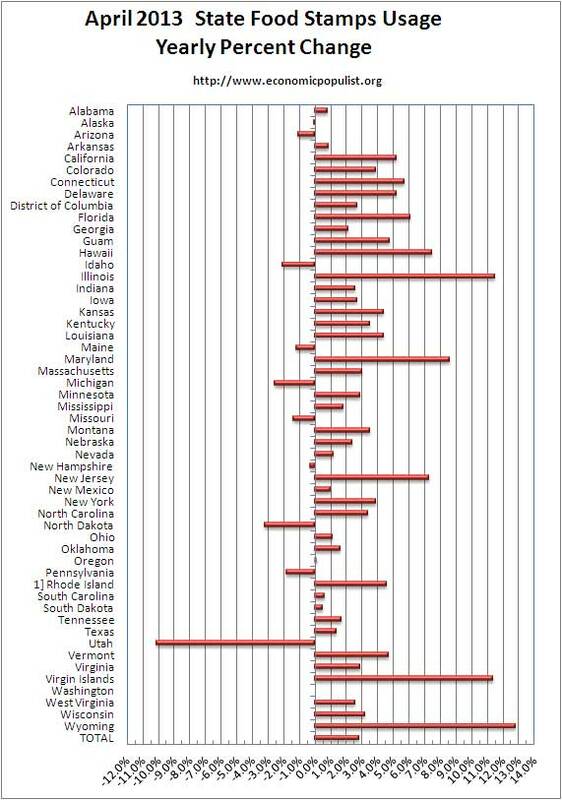 Below is the yearly percent change in food stamp usage per state. As we can see with the recession claimed to be over in July 2009, in most states even more people are going on food stamps. In the past year, the total population increased 0.7%. Lately there have been claims from some in the press and Congress that SNAP, the food stamp program is ripe with fraud and abuse. This is simply false. The economic realities of the new America are the reason food stamp usage has risen so dramatically. Next time you go to the grocery, watch for the food stamp cards. You will be surprised just how many are using them and fraud has nothing to do with it. Most people are broke and the wages statistics back that fact up. This article is a statistical update to our popular posts overviewing food stamp usage.